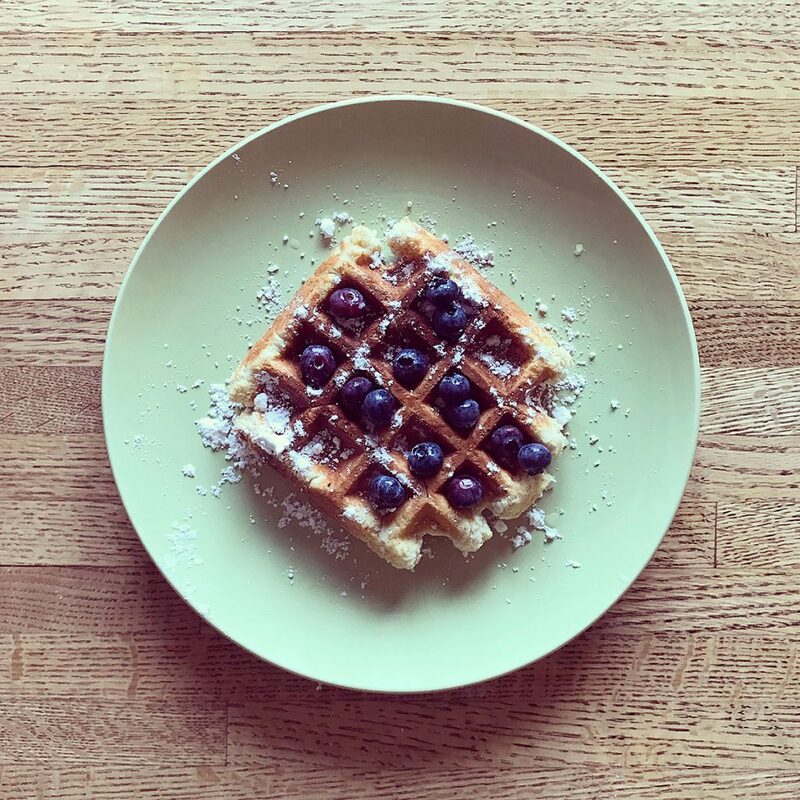 When we make Belgian waffles, we cook up a big batch using package-free ingredients from bulk stores. 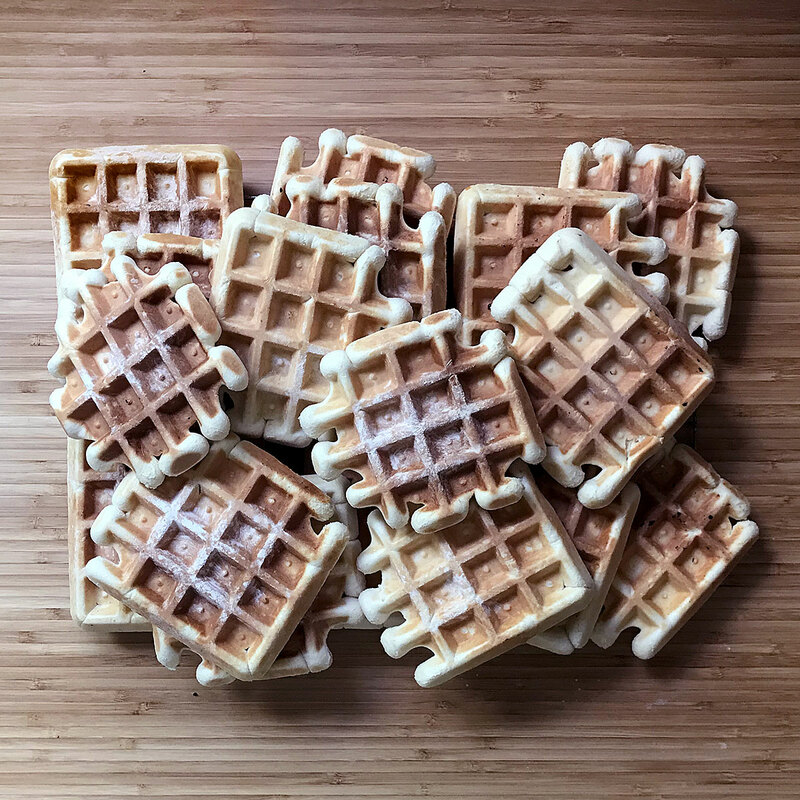 We eat a couple fresh off the waffle iron (which I got for $4 at a garage sale) then freeze the rest for quick and easy breakfasts later in the week. Topping them with fresh blueberries makes them extra delicious! 1. Mix softened butter, warm milk and vanilla in a glass measuring cup or small bowl. 2. Mix flour, baking powder and salt in a medium bowl. 3. Beat egg yolks with sugar using a whisk attachment on a standing mixer. 4. Add butter-milk-vanilla mixture to egg yolk-sugar mixture and beat well. 5. Add flour mixture and beat well using dough hook attachment. 6. In a separate bowl, beat egg whites with an electric hand mixer until they form peaks, then mix into dough. 7. Let waffle dough rest for 15 to 30 minutes before cooking. 8. Form small dough balls (roughly 2 inches in diameter) and cook on a waffle iron. I am so supportive of what you do, but help a newbie out here. Do you put eggs in your waffles? Where can you get eggs where you can reuse your cartons? We can no longer recycle egg cartons (paper or plastic) where I live in Oregon. How do you wrap your waffles for freezing? Hi, Lynn! I do put eggs in my waffles 🙂 I get eggs from a zero waste grocery store where I bring my own carton (though they also have extras customers can borrow). In the past, I’ve been able to get eggs from farmer’s markets with my own carton (or borrowed carton), too. If those options aren’t available to you, the next best option is to buy eggs in paper cartons. While the paper cartons might not be recyclable, they’re 100% compostable. If you have a compost bin, you can break it up into small pieces and use it as “brown material” for your compost bin. Or save the paper cartons for someone who has a compost bin—they’ll be grateful for the contribution!